I was diagnosed with a fibula sesamoid fracture on my left foot. I feel like I am walking on a golf ball and that is what I call it now. I walk on the side of my foot to keep the pressure off of the ball of my foot but that is causing knee pain and hip pain. 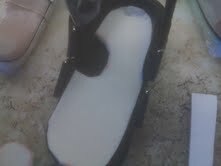 The podiatrist that I saw took one set of x-rays sold me cushions for my shoes and arch supports to wear. I tried those for 2 weeks and no relief. When I returned to the podiatrist he suggested since the arch supports provided no relief that I try a cortisone shot. The shot took the inflammation out of my foot,for about a week, so it felt like the golf ball went away but the pain was more severe since there was not any extra padding on the ball of my foot. I returned to the Dr. 2 weeks later and he said there is nothing else he can do surgery is my only option and sent me home. I feel after reading your blog that I really need a second opinion before I let anyone do surgery on my foot. My question is do I get that second opinion from another podiatrist or do I try to see an orthopedic doctor? I am scheduled for surgery on December 28, 2012. Any help or advice is very much appreciated. I have cried with my husband over this whole situation and how frustrated I am please help. Thank you for paying me the biggest compliment allowing the blog to help you. Please cancel the surgery so that the next 6 months can be dedicated to healing, not hoping the surgery can be avoided. I would not focus on the surgery, even though you may go that route in a much more enlightened frame of mind. The following checklist should help you focus on what you should be doing over the next 3 months. All of this is in the blog. Daily Use of Removable Cast with EvenUp on the opposite side. Accommodation if more off weight bearing is needed. Daily 1500 mg Calcium and minimum 1000 units Vit D3. 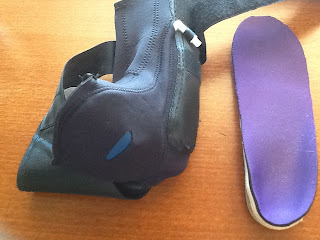 Shoe inserts that take the pressure off the sesamoids (under the first metatarsal), normally with good dancer's padding. Spica Taping daily to restrict toe bend. Activity Modification to minimize activities which reproduce pain. MRI ASAP so we have one to compare to in 6 months if necessary. No more cortisone shots please since they can delay healing and mask pain. I have many patients in pain. It is a very disturbing, challenging, fascinating problem. This introductory lecture by Lortimer Moseley discusses how pain becomes it's own source of pain. The brain senses a danger that does not exist, or has existed in the past. It is a fascinating talk. Hopefully, for patients living in pain, it is the doorway to a better tomorrow. This is my prayer for you. It has great validity. Okay any help would be appreciated. 5 years ago I had a stress fracture in my sesamoid bone The one Under my second toe. I continued to work out on it and the pain went away. Dr Blake's comment: You have two sesamoids, extra bones like kneecaps, under the ball of your foot (sub first metatarsal head). One of them is closer to the side of the foot (tibial or medial sesamoid) and the other is closer to the 2nd toe/metatarsal (lateral or fibular sesamoid). It was probably the lateral sesamoid that you injured. You can imagine the irregularity in the sesamoid that is injured here showing bone remodeling and some break down. About a year later it came back with a vengeance . I tried conservative therapies for a year. Boots, rest, massage, cortisone. Well the bone had necrosis and was completely removed. Dr Blake's comment: Sound like you did the right thing. Once a sesamoid is removed, the other sesamoid is now more prone for injury and requires a lifetime of dancer's pads and/or orthotics to off weight the area. A blue dancer's pad is easily applied to the shoe insert that came with the shoe to off weight the area. Everything was fine and pain free. About 6 months ago I was barefoot trying to get a door open and kicked it hard. I fractured my other sesamoid in the same foot. So stupid of me! It is Once again not healing. I don't know what else to do. It hurts to walk. I am 29 very active and in good shape. I know having the other sesamoid removed can cause problems, but do I have another choice? For this current fracture have tried rest, ice, cortisone, and A boot. Any help would be appreciated. I am scared and frustrated. first of all thank you very much for your blog, it's very informative. My name's Pierre and I am based in London. Could it be please possible to have your opinion on my case? 3 months ago, I injured my foot playing football - what you guys call soccer ;). I saw a foot surgeon and after X-Ray and MRI he diagnosed Sesamoiditis. At first, pain was mild, and I could walk as much as I wanted and could run for one hour at the gym. I couldn't play football though. A podiatrist made me some special insoles, but I think it made my shoes too tight (they occupied too much space) or they had much "arch" thus putting pressure on toes (is it possible?) and the pain became much worse. 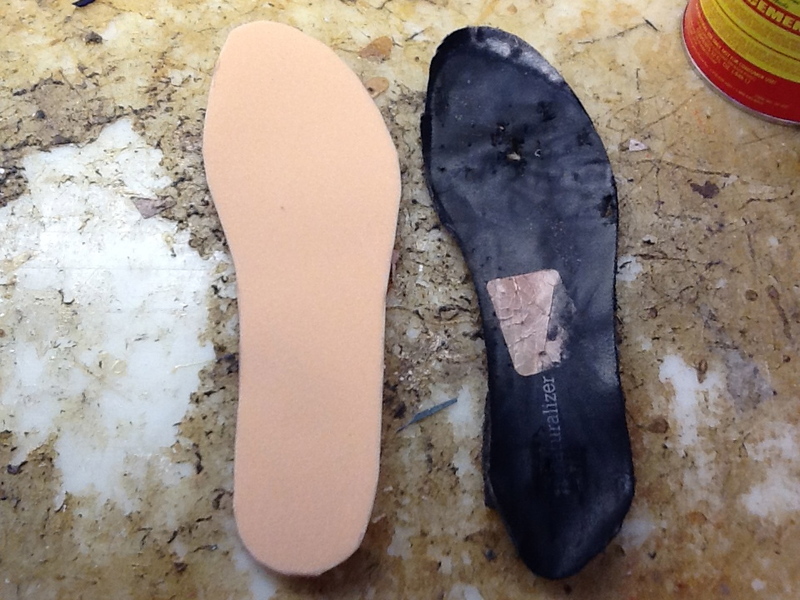 Dr Blake's comment: Definitely, any shoe insole, even designed with the best intentions can place the body's weight in the wrong place, or make the shoe too tight, or create motion when the best is to limit the motion for awhile, or a combination. With orthotic therapy, much experimentation can be needed, and the technician designing the inserts has to have some tricks up the sleeves, and be willing to experiment. There is just too many factors to consider, and even if known, sometimes you just have to take an educated guess on which direction to go. Golden Rule of Foot: If the insert makes the pain worse, remove immediately, re-introduce a few more times, and if still a bother, definitely modify and do not wear until modified. I then spend a week in a removable cast, but I had to remove it because it was putting pressure on my foot / toe and was hurting even on a rest position. Dr Blake's comments: The removable casts for sesamoid pain must have an off weight bearing float placed into them unless immediately comfortable. See if the brace shop or Doc's office can do that for you. I typically use 1/4 inch adhesive felt, and may have to increase to 1/2 inch by doubling over. I have recently had another X-Ray and MRI (I have the CDs but I am not sure if I can attach the contents in an email). It showed the inflammation is worse than when I had the 1st X-Ray & MRI. I was told to rest and take Ibuprofen if pain for the next 3 months before another MRI and maybe operation. Dr Blake's comment: Non weight bearing to reduce the pressure on the bottom of your foot will cause more stagnation in blood flow and the appearance of more inflammation. It is weight bearing that pushes it back toward your heart and out of your boot. So, the weight bearing cast is important as I mentioned above. I am assuming with this conversation that the MRI revealed no fracture. Could you please give me your thoughts/recommendations: insoles, painkillers, calcium supplements, for how long can i walk, excercises / sport I can still do etc. any advice that you think would help basically. 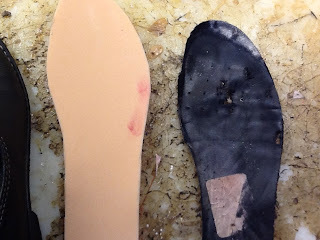 Dr Blake's comment: Even though you are in the Immobilization/Anti-Inflammatory Phase of Rehabilitation, finding a good doc or pedorthist to design a comfortable insole that protects the sore area will be very helpful even if surgery is needed in the future. Part of any program is to create a painfree environment. This is normally with ice packs for 10 minutes three times a day. Anti-inflammatory medication is fine if there is no bone injury. Straight pain killers are typically reserved to allow patients to get a good night sleep when needed for that function. Calcium and VitD supplements when there is a fracture is discussed at length, but it is never a bad idea to make sure you get 1500mg calcium and 1000 units VitD3 daily between dietary intake and supplements. Most patients with pain in and around the sesamoids are limited to biking with the weight on the arch, and swimming, for cardio, and multiple gym routines or pilates and yoga type. You can always pick and choose the positions to avoid or minimize. What do you think of the surgery: what's the success rate, how long after operation can I run again, are there any sports I won't be able to do again? Dr Blake's comment: What would they be operating on? Inflammation? Nothing you have said makes me want to go down that path right now!!! I had surgery on both of my big toes in Feb. 2009. It seems to be a hereditary issue since my brother had the same surgery a few years earlier. My father and grandmother had arthritis here too. I had cracked the toe while running for only 3 years. I cracked the bone on my left foot and it also had numerous bone spurs. Since the swelling did not go down after 6 weeks, surgery was performed. I had them xray the right foot, which also had spurs, so I opted to have both of them done. Yes, it was a painful surgery. I got a general and not a local so when I woke up I was in terrible pain. I blame the Dr. on that one. Dr Blake's comment: I feel that the first surgery was rushed, since inadequate time was given to let the injury completely heal. 1 year with rehabilitation of a big toe joint injury before surgery is not abnormal. The delay helps with understanding of the problem as the various aspects of rehabilitation are put into play. Surprisingly, some do heal avoiding surgery and the possibility of surgical problems. The other foot surgery was in the realm of preventative surgery. You are getting surgery since the problem will only get worse down the line. I personally do not buy into that approach, although many smart people do. I believe surgery should be your last resort, and not done until your present disability warrants that. I know I have strong biases in this regard, and it is important that you know where I am coming from when giving advice. In 2010, a year later, after training for a triathlon I developed Plantar Faciitis. It came on very slow but by 201i and now 2012 it has stopped me dead in my tracks. I have had pain for two years. I finally got an xray that showed a heel spur also. I have have tried everything, constant exercises, scraping, orthodics (OTC)and have stopped running. Nothing helps. Question? Did my surgery have anything to do with this issue?I am afraid of cortizone shots. Should I have an MRI? Dr Blake's comment: Big toe joint stiffness with loss of normal bending allows the plantar fascia to tighten and makes it prone for injury. You can usually combat that problem with plantar fascial stretching, especially the towel and rolling exercises described in my blog. You may be been tighter from your surgery, but maybe not. An MRI is needed to rule out a plantar fascial tear. Tears give unresponsive plantar fasciitis a bad name. Plantar Fasciitis normally gets better with stretching, icing, orthotics, activity modification, etc. If plantar fasciitis does not get better, I think of tear, fracture, nerve entrapment, bursitis. The MRI should definitely point you in the right direction. I am 59 yrs. old. Running was my new hobby. It kept me off of antidepressant after my husbands death in 2006. I am very thankful for my great family and friends, for my health and house, for my faith and job. I hope this Thanksgiving finds you with much to be thankful for, and much to look forward to in the coming months and year. Hi Dr. Blake and I hope you are staying dry! You asked that I email you with how I’m doing. We met on Tuesday, November 6th regarding pain on my right foot at the base of the second toe. 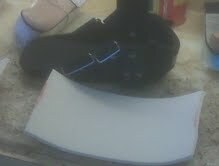 You prescribed a pad with an elastic loop to wear around the second toe along with some stretching and icing. It’s now been 11 days and I can’t say I’m felling much different. The pad is irritating to wear with sneakers or boots because when I slip my foot into the shoe, the elastic loop gets pulled down and irritates the skin at the base of the toe. Sometimes I have to take it off for a while. I find that when I wear my clogs with an open heel, however, it is much more comfortable. I don’t usually wear clogs but it’s the only shoe that I can wear the pad pretty much all day without discomfort. I’ve been pretty religious about wearing the pad regardless. I’ve been bad about the icing. I’ve only iced twice since seeing you. I do the stretches but not daily. So I haven’t been the perfect patient. Hey Alicia (name change), Thanks for the update. Try getting a digital gel pad at the Sports Shop to put under the splint. 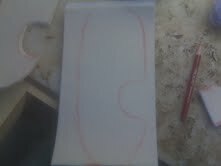 It is a long finger looking structure, that you can cut into 3rds to place over the one toe. I have also attached the link to Silipos company that makes these things. Then you can put the splint on tighter even. 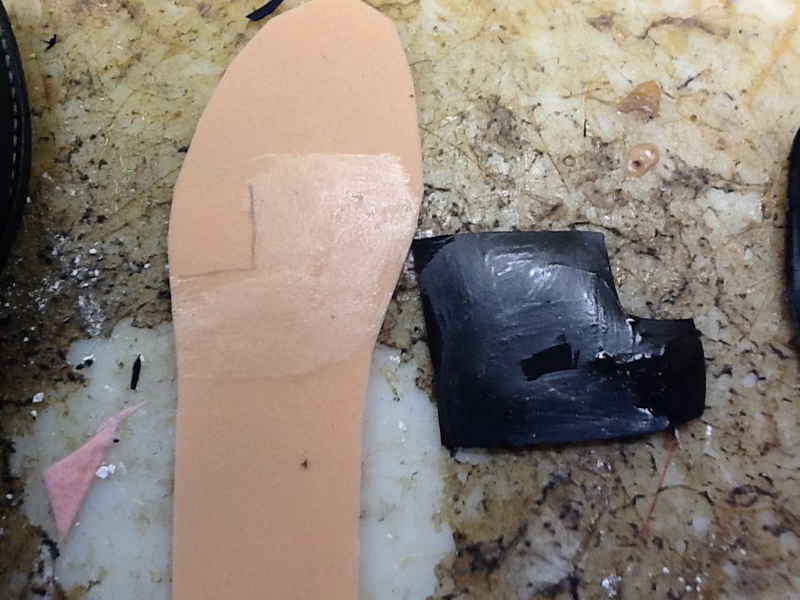 You can also use paper tape on the top of your foot to tape the splint down so it will move less. Attached is the note I wrote. Definitely ice twice daily, since the pain you are feeling is inflammation. Remember to stretch and perhaps buy some Yoga Toes so that we can begin to introduce them. Sure hope this helps. Rich PS If the icing does not bring down the inflammation along, then we can have you ice and go to PT. They would love to work on your foot. 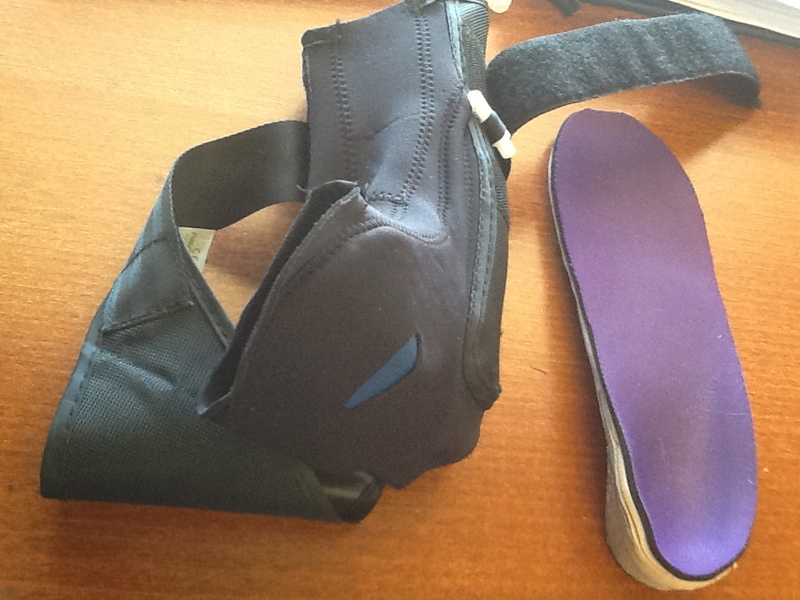 Budin Splint is a powerful stabilizer of the toe joints. When the elastic band is irritative, a digital gel pad can be used initially over the toe, or just tape to hold down the band and prevent it from moving. Alicia is a return patient I have not seen for about 4 years. Nancy has pain in her right foot and second toe area for about 6 months. Her pain level on a scale of 0 to 10 is about 4 or 5. She is taking some Advil for the pain. 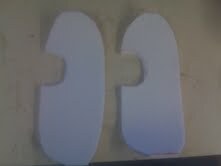 Has 2 pairs of orthotics which both have reverse Morton's extensions made by Dr. David Hannaford. She is a 59-year-old. She is 5 feet, 128 pounds. Her activities that she likes are West Coast Swing, water aerobics, Zumba and dance aerobics. She would like to enjoy them without discomfort are her main goals. She has had no past hospitalizations or surgery. She is on no special diet. On my examination, I found someone who had pain in the 2nd metatarsophalangeal joint plantarly. It is sore on maximum plantar flexion of the joint, not dorsiflexion. She has full range of motion. There is no evidence of instability. She has always had a short second toe and I think that short second toe may be raising up just a little bit or the 1st and 3rd toes may be going under it. In either case it would trap the second metatarsal head against the ground and cause irritation. 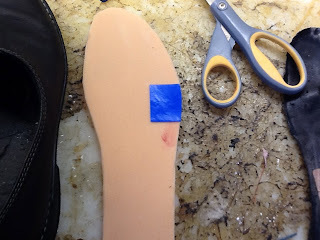 If you couple that with her reverse Morton's or dancer's pad, that puts the weight off the first and onto the second, so as part of her treatment I reduced the padding under the 2nd metatarsal head. Alicia's 2nd toe is much like this. When the toe is being held up in the air by being above other toes, and can not physically get down to it's normal level, pain develops under the metatarsal toe joint. The pressure at push off stays too long in the one place. 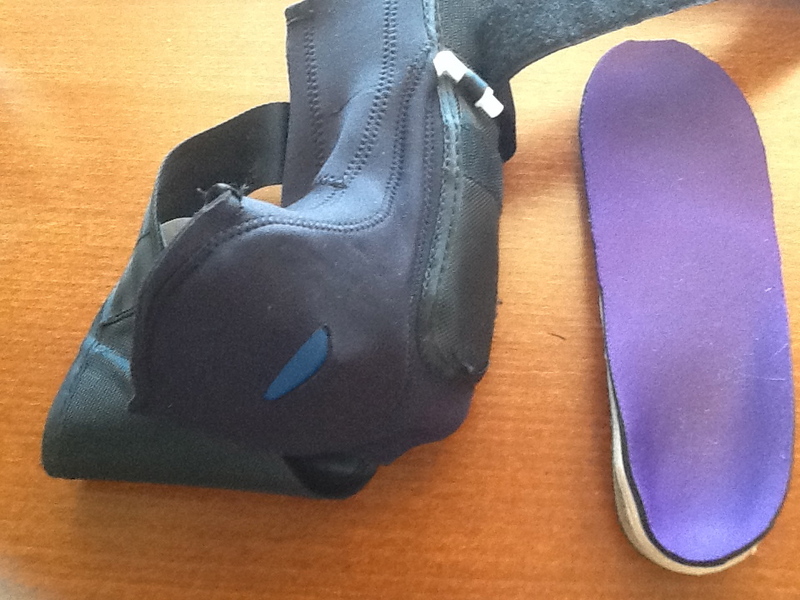 The splint is designed to pull the toe down into more normal alignment. 1. Capsulitis symptoms, right 2nd metatarsophalangeal joint, 726.90. 2. Right hammertoe deformity, 735.4. PLAN: So today orthotic devices were evaluated and on the right side the area under the 2nd metatarsal head of the reverse Morton's extension was removed. I encouraged her to ice twice a day, encouraged her to stretch the toe in a plantigrade direction without pain. I may go to YogaToes once it is less painful. I gave her a prescription for 2 Budin splints and this will be designed to hold the toe down. She is advised that she can easily adjust the bottom if there is any pressure. The website below will let you know how to donate your shoes. Thank you. I would like to introduce a fascinating topic called "Graded Motor Imagery". I have several patients who have used the technique to help with their pain or nerve syndromes, several patients who have been exposed to it, and many more that I will now expose and emphasize as part of their pain treatment. The Noi Group has a well organized website to let you get started. The photos below are part of the process of laterality--recognizing which side of the body a photo is taken. Amazingly, in many nerve injuries, we lose the ability of our nervous system to process this. I hope the videos, websites, and photos are a good enough start to help you or a loved one in the overwhelming process of healing when all seems to be losted. It is many times that the spouse or friend must help the patient take the initial steps towards healing. This is a process that can be done alone, or helped tremendously with another. These photos are part of the first and very vital steps in Graded Motor Imagery called Laterality. The links above contain the website to login and begin the process now. 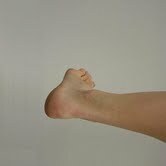 The patient is asked to identify which foot is being shown, and later asked to imagine their foot in that position. David Butler is a physiotherapist in Australia. After you hear this 40 minute presentation broken in 4 parts, you will want to have him over and make him your best friend. What a character!! I believe the main parts of this process are adequately introduced. Here a patient with complex regional pain syndrome explains her use of mirror therapy in a touching manner. More Decorative Canes: Why Not have some Fun!!! I came across your blog while searching for an answer to my ankle problem; I am wondering if you can give me some idea? I am a 22 year old female, BMI is in the normal category; I injured my right ankle when I was 12 (jumping down the stairs). From what I can remember, it was really painful but I didn't do anything (compress with ice etc) and I only went to the doctors some times after. I think the doctor said one of the ligaments is torn. I have been wearing ankle braces and minimize sports activity (though still keep on running occasionally). There is not any problem, although sometimes in the morning when I get up, I feel the joint is a bit "tight" or sore but not up to a level that is painful and the symptom is gone soon after. Dr Blake's comment: This is fairly common for joint injuries. The symptoms may plateau below perfect, but definitely manageable. There is probably some scar tissue in the wrong place, but the disability of removing it is far worse than the disability of leaving it alone. However, 2 months ago when I woke up (was woke up by the pain actually) the pain is unbearable, even if I did not touch the ankle. Standing was not possible and I had to use crutches. I went to the doctors and was diagonosed arithritis, happened for no reason (the blood test was normal). I took Naproxen sodium and Ranitidine tablet for 2-3 days before I can walk independently without crutches. Dr Blake's comment: This may or may not be separate from the old injury. Sleeping in the wrong position for an extended period of time can cause the joint lining to be pinched. The joint lining is full of nerve endings and when and when irritated are very unhappy. This pain normally goes down over 4-5 days, unless some extra scar tissue is stuck. The treatment for this acute type of pain is icing for 96 hours 3 to 4 times per day to reduce the inflammation. Arthritis always sounds bad and permanent and dark, but actually means joint inflammation. Yes, you had joint inflammation. The rest of the seriousness has to be followed and possibly explored with imaging. What I am not sure now is that my ankle is swollen, without pain. I do not notice if it is always like this (I know it is not completely right but never compare the size between left and right ankles). Since the incident 2 months ago, I stopped every sports and only walk and swim. I also have ankle braces on all the time no matter what. The swelling is positioned at the anterior part between Tibia and Talus bones and also a small part above the ankle. It appears to be twice bigger than my left ankle (normal one). Dr Blake's comment: Pain in and around the ankle causing swelling. Long after the pain is gone, and the disability, the swelling can remain and remain. Up to 4-6 months longer than the pain. Ankle braces can hold in the swelling. Inactivity can also hold in the swelling. It is best to judge what you should and shouldn't do, and what you should and shouldn't wear based on pain. Remember the wise old adage of "Listen To Your Body". It was not look at the swelling of your body for good reasons. What do you think might be the cause to the swelling? And would you suggest to go for an operation or any alternatives? Is it possible to avoid surgery at all in this circumstances? I am grateful for any comments that you have! Thank you for your time in advance. I have started to notice the beginnings of bunions on both feet. I am a 30 year old female and I was curious to see if there were any preventative measures I could start so that they don't get worse. I am a 56 year old female. I have been dealing with hallux rigidus for three years. Dr Blake's comment: Hallux Rigidus is defined as stiffness in the Big Toe Joint of less than 30 degrees of dorsiflexion (the bend of the joint as we try and push off). 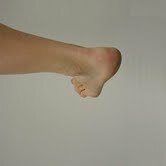 Normally the big toe joint (called the first metatarsal phalangeal joint) is between 75-90 degrees of bend. We normally need 75 degrees to comfortably function in sports, and 60 degrees for normal walking. This is a common measurement taken. Tonight my pain level is around 7. Dr Blake's comment: My favorite post on this blog is called Good Pain vs Bad Pain. Good Pain is considered pain levels of 0-2 on a pain scale of 0-10. 10 means you are in very serious pain and 1 means you are annoyed but still smiling since the San Francisco Giants just beat the Detroit Tigers in the 2012 World Series. 7 is getting very bad and we need to fix ASAP. My left big toe joint is totally frozen. It swells. It bruises. I walk funny. Since Sunday my knee on that side is sorta clicking/popping when I walk. My ankle swells. My foot looks awful. It’s like it is continuously bruised around the joint, along the base of the toes and on the top of the foot though I think some might be due to meds that I take and sun exposure and the rest to reinjuring it over and over. It’s ugly. Dr Blake's comment: I definitely agree that the discoloration is something different than the normal Hallux Rigidus. 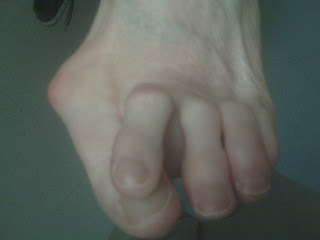 It seems to especially involve the first 3 toes and could be some form of arthritic or vascular problem. Is the temperature normal? If it is colder, I would say see a vascular specialist, if warmer, an arthritis specialist. Is the pain all from the big toe joint, or are other joints involved? All Anti-Inflammatory Medication can cause abnormal bleeding. Simple blood tests can tell us if you have any abnormal bleeding problems. I have never worn high heels in my life because I am tall. For the past five years I have been limited to flats. Three years ago I fell off of chair and came down on that toe. I already had damage there but this time it was the worse. When I went into the E.R. they thought it was a broken bone but found it was arthritis and bone fragments. They referred me to a podiatrist. I let it heal and did not go into the podiatrist until I damaged it again last winter. This time I had pain throughout the foot and was put on steroids for soft tissue damage. Dr Blake's comments: You are not going to get any absolution of your sins from me. When you keep ignoring the pain, the pain can become it's own problem. The skin discoloration could be a sign that your pain has been out of control too long. Prolonged pain can cause vasospasm (loss of blood flow) since the nerves feed the blood vessels. The loss of blood flow for too long can cause rebound increase blood flow which can cause skin discorations or ugliness!!! The vascular specialist would probably be the correct person in that scenario to see. During this first visit to the podiatrist he did x-ray my foot and said my joint had arthritis. He gave me naproxen and sent me to have an insert made. 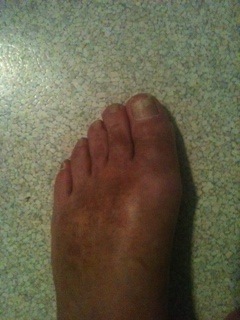 At that time the top part of foot over the big toe joint and then along the other toes was bruising. Old looking yellowish yet darker in some spots. Dr Blake's comments: Yellow, of course, is deep blood and the darker stains are the most superficial blood. Both of these colors are from the constant beating up on this or these joints. But, could indicate a bleeding problem. Please have some blood work including the standard CBC with Differential. This bruising gets better and then worse when I hurt the joint accidently or wear shoes that are too soft. Anyway, I never got the insert made. This past year the pain has been getting worse. This past weekend I wore new boots with the same heel as the other boots I wear. I wore them around for around five hours and it got increasing more painful to walk. When I got home my foot was throbbing. I took off the boot and it felt like my joint was coming apart. It hurt and the area around the joint swelled as well as my ankle. I did walk though and by Monday the next morning it was somewhat better. I was limping and it was really sore and I am yet today. Dr Blake's comment: I know when you have something for a long time, you just want to ignore it and live life. However, this problem is crying out to be treated seriously, and you must start with creating a pain free environment for it, and keeping it pain free for 3 to 6 months. This probably will mean a removable cast, like the Anklizer, to reduce the bend in the joint. Perhaps just a shoe like the MBT will produce less bend to minimize the discomfort. In this task however, you should be armed with good protective orthotics and the skill of spica taping. Fortunately I had an appointment with the podiatrist that same day Monday. Again I went in and he did x rays and said it was bone on bone. Dr Blake's comment: Bone on Bone means that the cartilage (pillow) covering the bone is gone and the bone nerve endings are exposed. Pressure from the opposite side of the joint produces pain since the pillow is gone. Cartilage has no nerve endings, so in a normal joint you do not feel the joint moving. In an arthritic joint, with exposed bone on one side of the joint hitting exposed bone on the other side of the joint, the nerve endings produce a lot of pain with this pressure. While examining my foot he asked me if I was diabetic. I told him I was not. He said my foot looked the way a diabetic foot looks. He was referring to the discoloration/bruising. I told him about the meds I take (nipedipine and hydrochlorthiazide) and what I thought some of the discolorations were along with injury. He really did not say any more about that. He then gave me three options. Do nothing, joint replacement or fusion. I asked him what he would do and he said if it was him he would probably do the fusion. He set me up to have the surgery on November 15th. Dr Blake's comment: If you are pre-diabetic, signifying possibly poor healing, you need to get that checked out before any type of elective surgery. Check if your drugs for high blood pressure can cause easy bleeding. Definitely, you need you internist to work things up and make sure you can have surgery in the first place, or do you need to get your circulation, blood sugars, platelets, etc, evaluated? I asked him if there was anything I could in the meantime meaning wrapping…something. He said just carry on til then. That’s a long way away. I have stairs in my house and my knee is making a sound/feeling every time I go from my room down to the living area. I am limping up and down and not putting any weight on that area. I don’t want surgery but I know something needs to be done because of the pain and the swelling. Right now I want to call my podiatrist and ask him for a boot just so I don't have to hurt that area anymore but I am leery as he did not recommend this on Monday. Dr Blake's comment: Doctors are human, at least some of them. You need to feel comfortable with any doctor who is making major decisions about the rest of your life. If you do not feel comfortable calling him, switch to another doctor. But, I would encourage you to stay with him and call. Doctors can not remember everything in the short time of the visit. Golden Rule of Foot: If a doctor does not discuss something you think is important, it is important, and they were just thinking of too many things at the time. So ask!!! Do you have any ideas? I want to walk again. I want to exercise. I feel like a cripple. I am active though not athletic. I hate the way the skin keeps being so discolored as if I broken bones. Please give some me some advice. I am wits end. The one good thing. When I lay down I have no pain. It's sore but it does not hurt. But I can't lay down for the months or years...can I? Nope got to work. Linda, I will have more time this weekend to explore your email. Definitely you should be in a removable boot for the next 3 months while you analyze the pros and cons of various surgeries. I will help. I need photos of your foot, copies of your MRI and xrays. I prefer you cancel surgery while you really think this out. Rich You also need to have a good vascular workup to make sure you will heal from any surgery. You do not know how much I do not want to let anyone see my feet. I looked at pictures on your website and mostly their feet look healthy. Mine look disgusting. If only they could just look and feel halfway good i would be happy. I took two pictures with my cell phone. Not good light. I can get better pictures too. I also have a nail fungus which I asked the Podiatrist to treat, he wants to prescribe the antifungus meds which I refused at this time. i wanted to read more about them. And I wanted the joint pain taken care of first. I can request xrays but never had an MRI on my foot. The tips of my toes are pink. There is no bruising on any of them. I wore open top shoes up to last month and both tops of my feet are discolored. The right foot top is dark like a permanent tan but not bruised like the left. The bruising was not as bad before I wore the boots on Sunday...anything constraining makes the swelling and bruising worse. If I know it is nothing I can live with discoloration but what is causing it? The damage to tissue? And i want to believe part of it is meds. I also take synthyroid. I realize it is late and I don't expect any answers... I just have to ask the questions. I have been dealing with a fractured seisamoid for several years now. I have seen orthopedic surgeons and a podiatrist that works with an Ortho group. I have had x-rays and an MRI confirming that it is fractured. I wore a walking boot for 5 very long months. I have taken anti-inflammatory medications, I have had an annual cortisone injection (which last about 6-8 months and then I tough it out). I have tried to have custom orthotics made, and every time they make me a new pair, it causes another area of the foot so much pain that it's worse because two areas hurt. I have heard a metatarsal sleeve is helpful. I used to be a recreational runner, but have not had that pleasure for about three years now. I do live near the mountains in Colorado, and I love to hike. I have found that shoes with stiff and rigid soles help, and I have stopped wearing heels except for an occasional special occasion like a Christmas party. I have a VERY high arch. My doctor is at the point of surgery, but I am terrified that all I will be doing is trading one pain issue for a host of pain issues, and that I won't even be able to hike. I have NEVER read anything good about that surgery or it's success. Is it possible to get a shoe insert made that is very hard & stiff to make even softer soled shoes more rigid? First of all, the biggest question after this amount of time is: Do you have pain from a sesamoid fracture, or do you have pain from arthritis that has developed within the joint, or a combination of both? If the pain is from the fracture, removing the bone will give you less disability than you have. If some of the pain is coming from arthritis that is settling in the joint (called Hallux Limitus Syndrome), than the surgery just to remove a broken sesamoid, may be unsuccessful, and gives sesamoid removal a bad name. The diagnosis is somewhat clinical, and 2 very good men in Colorado are friends of mine, both podiatrists-- Dr William O'Halloran and Dr Thomas Shonka. Please look them up. You need a recent MRI of the big toe joint, and some current xrays. When a patient decides that they are going to have surgery, then they have cortisone shots. Golden Rule of Foot: Never have long acting Cortisone Shots into a Joint in an attempt to avoid surgery. The cortisone will mask the pain, but could speed up the breakdown of the joint. I you get an MRI, I would be happy to help review for you. Yes, Dr Shonka and/or Dr O'Halloran can make, or someone they recommend, a great shoe insert and recommend a particular shoe, that stiffens the area, decreasing the bend, that helps your symptoms. But, please, try to have someone evaluate the possibilities of the pain being solely fracture vs joint breakdown. This is in the most important question to be answered now. Dear Sheila, The most important question right now is whether you have injured the joint (a condition called Hallux Rigidus). The three possible reasons you could have injured the joint are A) time with an unhealing injury, B) using cortisone to mask the pain (especially repeatedly), and C) the fractured sesamoid injuring the first metatarsal since the fragments irritate the joint. I would recommend you see Dr William O'Halloran or Dr Thomas Shonka in Colorado. Both are wise podiatrists, both are my friends. You should have a recent MRI and xrays. The joint can be easily assessed. If damaged, the surgery discussion is focused on removing the injured sesamoid and somewhat fixing the joint. Definitely, get this info first and see what you are dealing with. I do not recommend sesamoid fracture removal without an MRI. When the joint is healthy, and the symptoms and story as long as yours, I would have no problem recommending surgery. The surgery is not perfect, the disability is 90% better than before surgery, but you could be in the 10%. I would not hesitate to have surgery and take my chances after this long. If the joint is unhealthy, you need to assess pre-op anyway. You still remove the sesamoid, but the joint must be helped also. It may require a second surgery. You may require 2 different procedures at the same time. There are several possibilities, which all stem from the initial MRI. When trying to eliminate friction from the bottom of the foot, especially in cases of ulcerations, scars, calluses, and sore points, ShearBan and Engo are 2 great products. 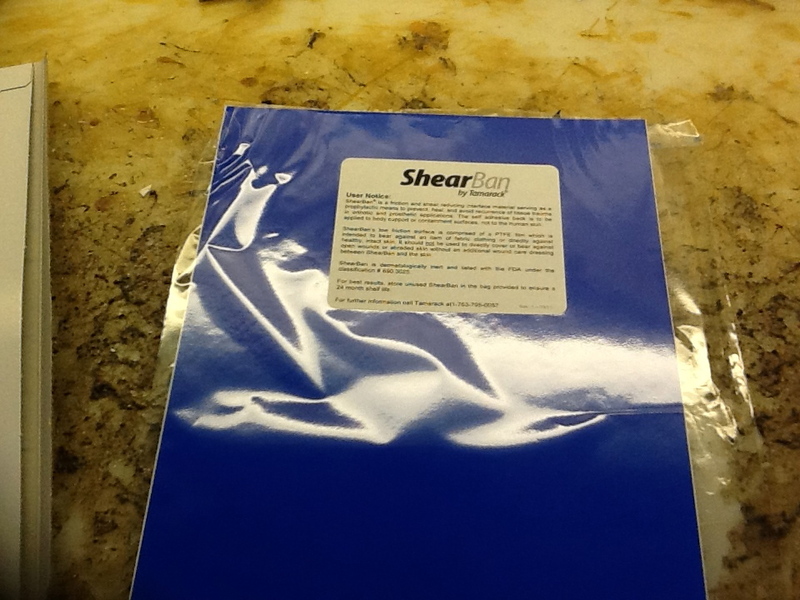 Here I am using ShearBan, with 1/8th plastazote or memory foam, with an accommodative pad to reduce both the vertical load and the shearing load (friction) on a developing ulcer. 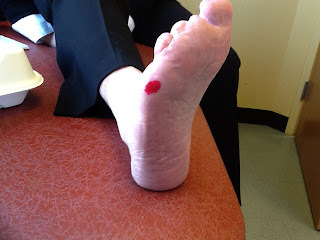 This patient has already had toes amputated from PAD, or peripheral arterial disease, and any developing sore must be protected as well as possible. 1/8th inch Memory foam (plastazote) from JMS Plastics to replace the shoe insert to reduce the vertical load on the sore area. 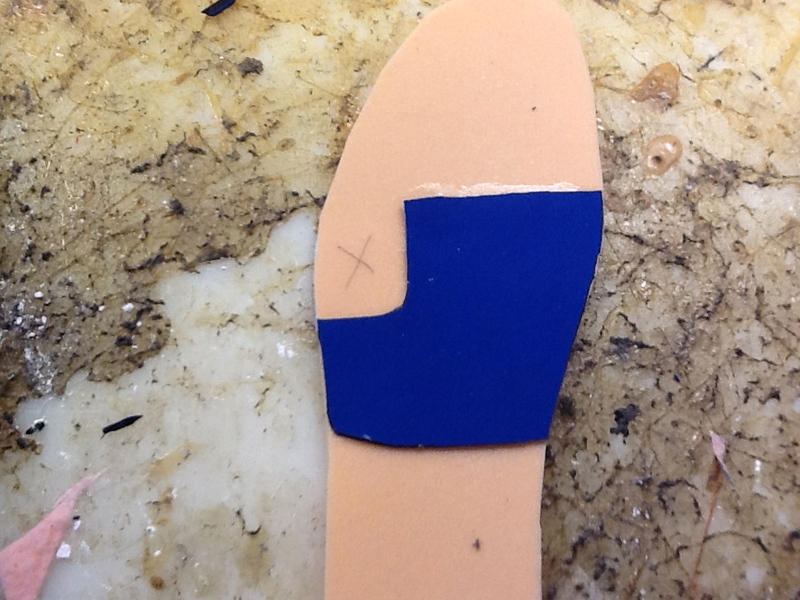 The shoe insert is placed into the shoe, and then the foot with the lipstick, is carefully placed. 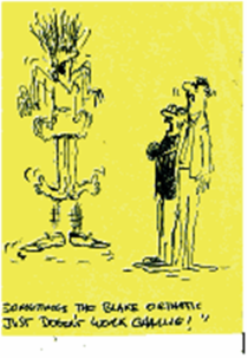 The patient is asked to walk a few feet. The first mark is always from the foot getting into the shoe, with the mark closest to the toes being where the sore is located. A small piece of ShearBan is placed on this area on the top surface of the memory foam in direct contact with the sore area. 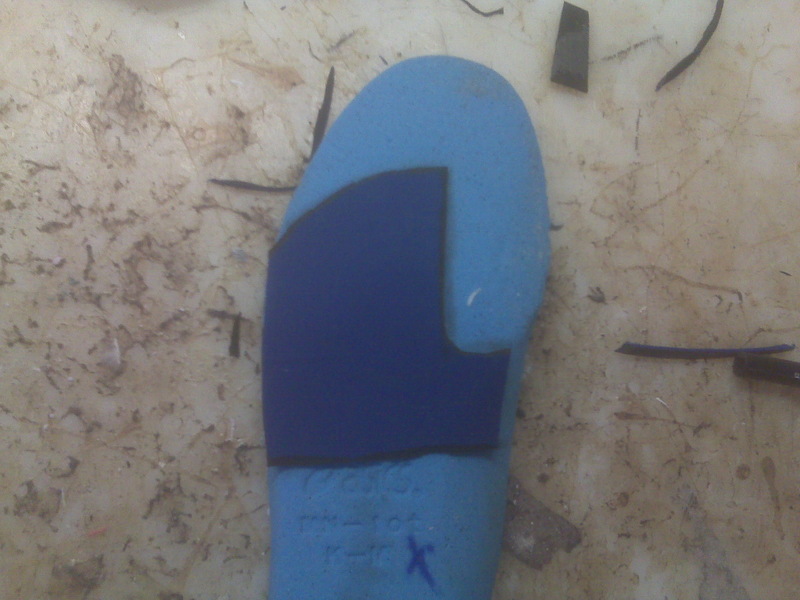 You want to reduce the shearing force in as small area as possible since you do not want the foot sliding too much in the shoe. Here 1/16 inch neolon, also from JMS Plastics, is placed on the bottom surface of the pad to off weight the sore. Here the 2 glued sided are joined accomplishing the off weight bearing. 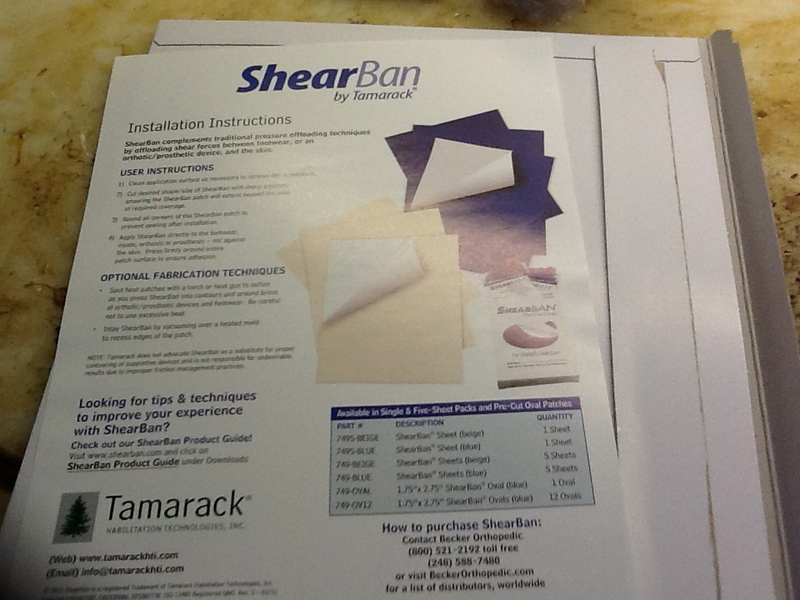 So, with the above treatment, this shoe insert has reduced vertical load, reducing friction or the shearing force, and off weighted the sore area. One of these functions should help prevent pain and further loss of limb. Posterior Tibial Tendon Dysfunction is a devastating problem. The earlier you start to support the ankle as the arch begins to collapse inward, the better. Most ankle braces tend to pronate the arch, definitely holding it in the wrong direction in an effort to stablize post ankle sprain. 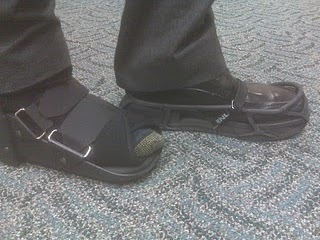 Recently, one of my patients saw an orthopedist who recommended this brace. I have never seen it before, but was impressed. I am not totally sure of the success of the air bag, but the basic design of the brace will work to fight against the arch collapse and inward collapse of the ankle. If we combine this brace with supportive orthotics, varus or medial shoe or insert wedging, stable shoes, an anti-inflammatory program, and of utmost importance a gradual strengthening program, then the patient may have a fighting chance. Since you need to get out of the brace at times, or if the brace is not a good fit for you, posterior tibial tendon taping is still a great option. It takes a good 10 times with any taping technique to learn the right tension to put on the tape and the right variation that works for you. Here are a photo from my patient showing the air bag placed in the arch. 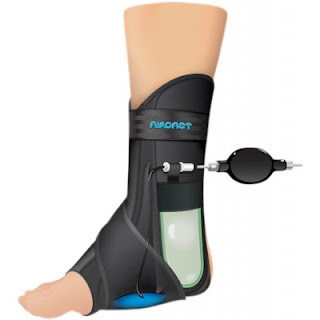 Since many posterior tibial tendon dysfunction patients have significant arch pain, this may or may not cushion the interface between the brace and the shoe or orthotic device. The Aircast AirLift PTTD Brace has a airbag for under the arch. I am showing the medial side (arch side) of the foot. The main strap of the brace was pulled forward to show the air bag, but will pull up on the arch. The brace is taller than a standard ankle brace, and you are in control how much to inflate the bag and how much tension you put on the strap. Standing next to the brace is my orthotic device. This device by itself made her arch too sore and even though it controlled the pronation motion and protected the foot, it could not be made comfortable. The combination of brace and orthotic is working well right now. Here is a reminder video of the posterior tibial tendon strengthening exercises.